See some of the mattresses that we offer. Sleep is vital when it comes to good health, but no one can sleep well if they are not comfortable. Thankfully, finding comfort is easily achieved by choosing the correct mattress. Mattresses are not just an investment for good sleep, but an investment for overall wellness. Deep sleep makes all the muscles in your body relax, which means the body relies on the support system their mattress supplies. We want to help our customers find the perfect mattress by supplying a wide variety to choose from - all differentiating in size, comfort levels and prices. 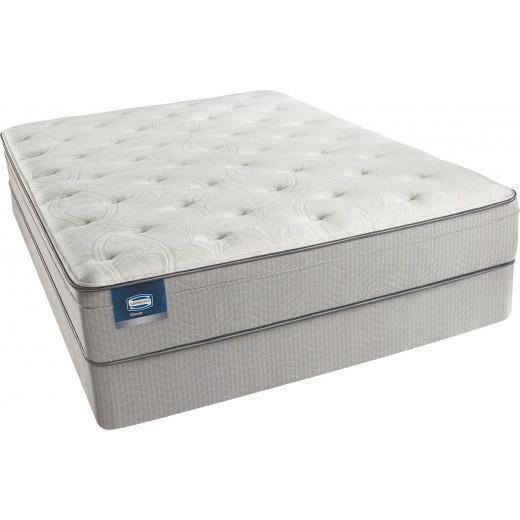 The Carter Plush Mattress by Simmons BeautyRest, is comfortable and offered at an affordable price. By using the basic innerspring mattress technology combined with a coil support system, .5-inches of GelTouch Foam, 1-inch AirCool Foam, 1.25-inches AirFeel Foam and the SurfaceCool Fiber; this mattress will provide a comfortable and cool sleeping temperature. The Carter Plush has been our best selling mattress for three straight years. It is suitable for guest bedrooms, an every night option and for customers who prefer to sleep on their back or on their side. This product is available in twin, twinXL, full/standard, queen and king sizes. The Carter Plush comes with a 10 year full warranty.